Some of the highest profit poker strategy and concepts ever published. Let Mike Caro help you win in dynamic new ways. 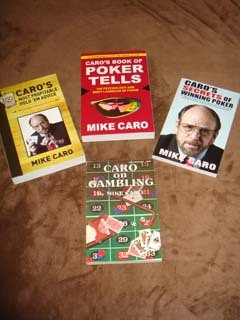 This specially priced book bundle includes Mike Caro’s Book of Poker Tells, providing over 170 photos and explanations of when opponents are bluffing and more; the complete missing arsenal — Caro’s Most Profitable Hold ’em Advice; the textbook of greatest Caro Seminar teachings — Secrets of Winning Poker. Plus, the classic, collectible book, Caro on Gambling (selling individually at Poker1 for $20) as a free bonus. Here is the most powerful winning poker information ever put in print. These four remarkable Mike Caro books (including the free bonus Caro on Gambling) give you the tools you need to conquer and command any poker table in the world. — The Complete Missing Arsenal. A remarkable hold ’em toolbox, combining proven tactics and seldom-discussed secrets! Book included: ✓ Caro’s Secrets of Winning Poker. Mike Caro takes everything from his powerful poker seminars and puts it in writing, explaining concepts and strategies in ways you’ll never forget! This special collection from the legendary “Mad Genius of Poker,” Mike Caro, has never been offered before. It’s the proven training you need to pursue poker seriously and target every chip on the table!